has launched the world's first Ultra HD capable machine for the home – and there's not a disc drive in sight. Promising a BBC iPlayer-on-iPad style download service, the Redray 4k Cinema Player goes on sale this month for around £950 to become the first commercially available Ultra HD source. It could effectively see the end of both Blu-ray and even the whole idea of the shiny disc itself. "If you go around and ask people who are touching the industry – like we are and all the consumer electronics companies – they would probably concur with me that there's not a lot of viability for physical media anymore," says Ted Schilowitz, 'leader of the rebellion' at Red Digital Cinema and evangelist for all things 4k, though he admits that Blu-ray might not be dead just yet. "Whether the companies that still live in that world choose to put their last hurrah out in 4k is yet to be determined." 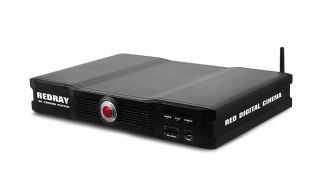 Not that Red is banking on downloads for the Redray, which can also read Ultra HD files – in the MP4 format – from both USB drives and SD Cards. It can also upscale from SD and HD to Ultra HD. The Blu-ray Disc Association has yet to ratify a new specification for Ultra HD – also known as 4K – but even if it did, manufacturers would then have to sell a third generation of Blu-ray player. After poor sales of 3D Blu-ray players, that seems unlikely. Red's download service is due to start this month with Odemax as the only confirmed content provider, though Schilowitz confirmed to TechRadar that Red is in talks with the 'usual suspects' to offer Ultra HD versions of major studio releases alongside independent films and remasters of classics. "There are lots of veins of 4K content," says Schilowitz. "All will have a place on this platform." Schilowitz couldn't confirm which companies Red is talking to, but the current suppliers of movie downloads – such as Netflix, Amazon and Apple – could be involved. Netflix showed-off 4K streaming on Samsung's stand at CES 2013, though that was using the new HEVC format. The proprietary compression technology used by Red to make Ultra HD films small enough to deliver over the internet is staggering, with file sizes cut by 500:1 to achieve roughly 18GB for a two hour film. Redray has built-in 1TB storage, so can hold around 100 hours of Ultra HD content, though that can be expanded upon. Although Red could easily supply larger, less compressed files, Schilowitz thinks that the current size is the sweetspot. "As with resolutions, broadband speeds are upping, especially in emerging markets – South East Asia, China, South Korea and Hong Kong are already blazing." Compression or none, visually the end result is promised to look identical to what you'd see in a 4k digital cinema. The official Ultra HD format – which uses a 'Quad Full HD' resolution of 3840x2160 pixels – is slightly narrower than the True 4k Cinema spec of 4096x2160 pixels that Red's cameras film in, but the Redray is able to crop and scale the decoded image to fit the attached display. "Ultra HD TVs can handle multiple rasters, too, so can do True 4k and Ultra HD, and will scale accordingly," says Schilowitz. "Redray supports both." With first-gen Ultra HD TVs like the Sony KD-84X9005 and LG 84LM960V costing north of £19,000, is the Redray actually addressing a need? Schilowitz – whose company was originally based around 4k and 5k camera equipment (the EPIC, Scarlet and RED One), but now covers 4k post-production, too – thinks that higher resolutions are already becoming normal. "If I'm looking at a small screen like an Apple laptop or my Retina iPad I'm looking at higher than HD already, so my eyes are attuned to it," he says. "When people go into a store and start looking at 4k they get up really close to it and before you know it they see what we all see, which is that 1080p just is not adequate anymore – they strive for more, they want to be closer and more immersed in the experience."